Configuring your wireless settings is important to ensure that your wireless network is safe from unauthorized access and intrusions. With the Linksys app, changing the wireless settings of your network is now easier and more convenient. IMPORTANT: Changing your wireless settings may cause your wireless clients to disconnect from the router. Depending on the changes that you’ve made, you may need to reconnect your wireless clients with the new settings. 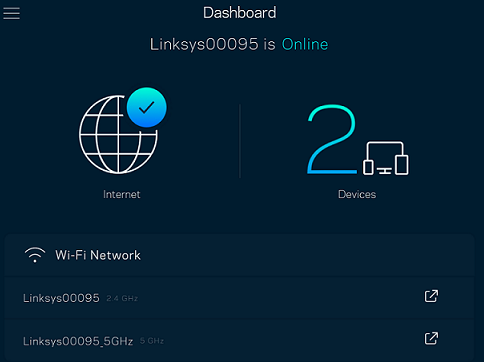 On a mobile device connected to your existing network, tap the Linksys app icon. NOTE: Options in this section may vary depending on the device you are using. Options like the Smart Connect is only present on some Linksys Smart Wi-Fi Router models. Alternatively, you can also tap on Wi-Fi Network on the Dashboard. QUICK TIP: Tap to share your Wi-Fi credentials via Text Message, Email or Copy it to clipboard. Tap the field you want to change then tap Save once done. Wait for the settings to be saved successfully then reconnect all wireless devices, if necessary. 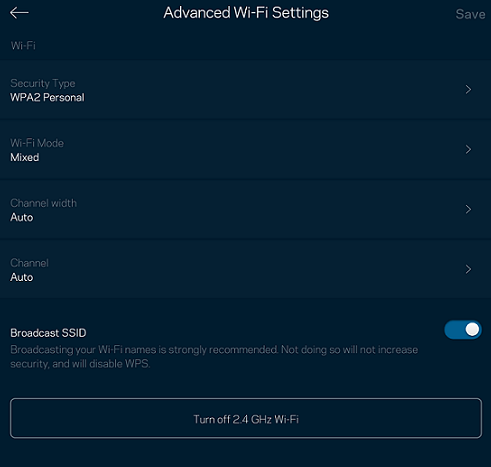 The Advanced Wi-Fi Settings section on each network band also allows you to configure other settings such as Security Type, Wi-Fi Mode, Channel width, Channel and Broadcast SSID. Each time you make changes, ensure to tap Save for the setting to take effect. Otherwise, tap on Cancel to discontinue the changes. You can also tap the bottom bar to turn off the network band of your choice. 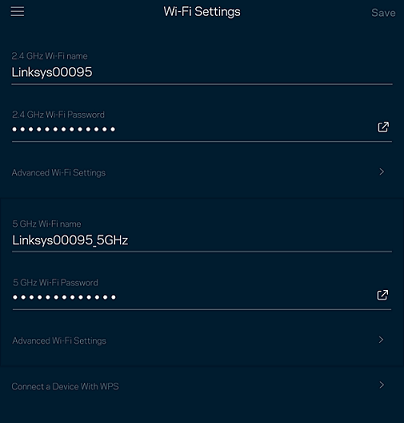 You should now have successfully changed your router's wireless settings using the Linksys app.